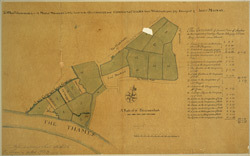 This is a 19th-century tracing of a 1727 survey. The plan's title features along the top, with compass star in the middle and scale bar at bottom right. A key to tenants and size of plots to be let appears in table down the right side of the sheet.